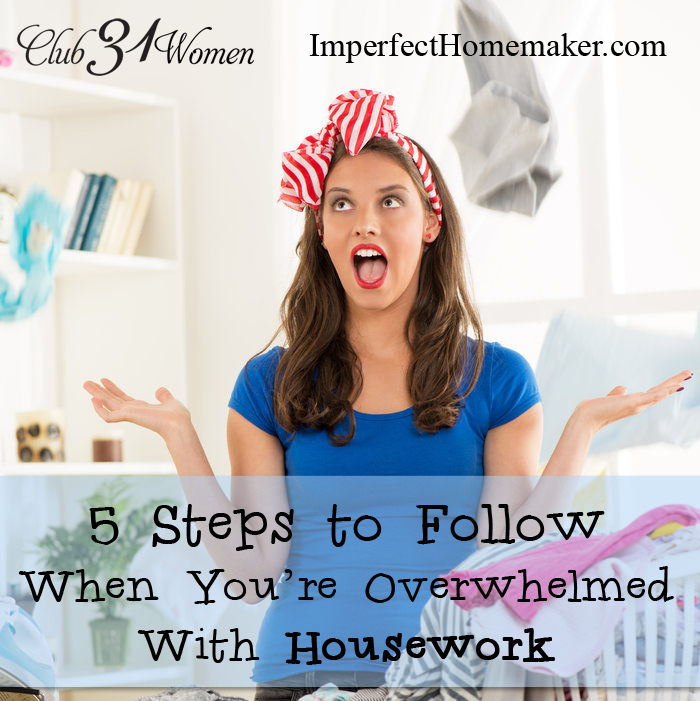 Are you overwhelmed by a messy house? Sometimes it seems like no matter how hard you’ve tried, things have somehow gotten out of hand. 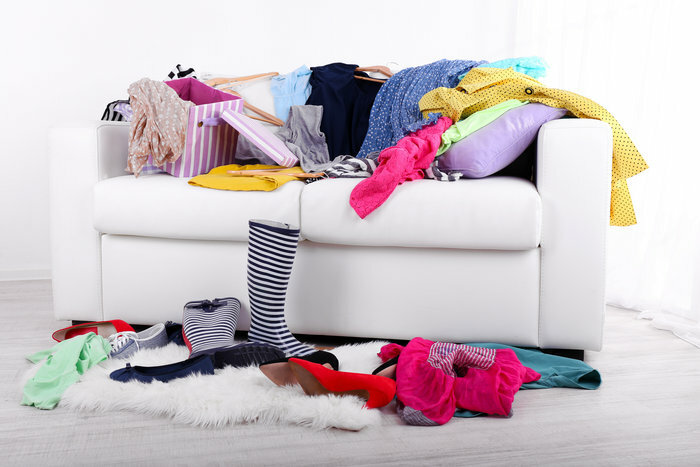 Maybe you had a very busy day where you left the house in a hurry with strewn-about clothes in your wake, got home for a late supper, and fell into bed exhausted with the dishes still in the sink. When you awake in the morning and look around, all you can see is the explosion that seemed to take place in your house the day before. It’s all so overwhelming that you don’t know where to start! You become paralyzed by your feeling of overwhelmingness (a real word: I looked it up!). Oh, I’ve been there far too often. But thankfully I’ve learned the formula to overcoming this crisis. If you think you can handle my incredibly complicated system, read on — if you dare. 1. Put one thing away. 2. Put another thing away. 3. Put another thing away. 4. Put another thing away. 5. Put another thing away. Yet this is all I do when I feel like the house is getting out of control. 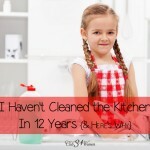 By putting just 5 things away, I am amazed at how much better that kitchen counter looks, and I’m then ready to “just finish cleaning this one counter”. But then that counter looks so good, I want the opposite counter to match, and it only takes a few minutes. I start getting on a roll, and before I know it, quite a bit has gotten done. It doesn’t take long for me to realize things weren’t as bad as I thought. This whole thing may sound crazy some of you, but others of you will know exactly what I’m talking about. It’s just part of our personality to get overwhelmed easily. So rather than working against our personality, we need to work with it to do what works for us. Usually the easily overwhelmed type are also the easily bored type, and that means the same trick doesn’t always work every time. That’s okay! I have more tricks in my bag. Instead of putting 5 things away, I challenge myself to find 5 things to put in the trash. Or I find 5 dishes to put into the dishwasher. I set the timer for 1 minute and try to put 5 things away before it goes off. I set the timer for 1 minute and try to clear one counter before it goes off. I work 5 minutes in one room, then 5 in the next, etc. It only takes a few minutes to get the major surfaces cleared off and I don’t have that panicked “This is impossible!” feeling any more. I can calmly and rationally say, “Dishes? Oh yes, I know how to wash dishes” and then get to it. 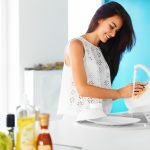 Even though these “tricks” may seem silly and unnecessary, they’re a much better alternative than giving up and doing nothing – a true danger for some of us. And when that happens, things are twice as bad the next day. 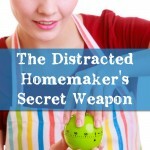 So no matter what you have to do to get yourself “de-overwhelmed” – do it! Staring at the mess isn’t going to clean it up. You just have to put on your gloves and go to it! Have a husband who works nights and sleeps when I bring kids to school. Can only do clean up that is not making noise. ! Feel stressed and bothered by this. Makes me not want to do anything! I get kids from school and then it’s cooking, homework bath time. By the time I could get noisy is when they are in bed, but by then I am also tired, please help! I love the picture of 5-year-old! I feel that way at times, too. I love this post, as well. It reminds me of my perspective on exercise. When I don’t feel like exercising, I promise myself I can stop after 10 minutes if I want to, but I never do. It’s like they say…. you eat an elephant one bite at a time. Thanks for the encouraging reminder, MaryEllen. Blessings to you and yours. I, too, find that if I just get moving, there is improvement. I can’t expect perfect to happen in five minutes, but it sure feels better! Brilliant! So helpful! Thanks for sharing. Thank you for this. It may seem simple to some, but it’s very helpful and encouraging for me. I’m off to go challenge myself to something!